Lay out BurLene® Blankets (burlap side down), lapping 6" on top of slab, and allowing sufficient lap over edge, to seal-in. Fog spraying concrete and/or pre-wetting burlap side of BurLene® may be helpful in most applications. After each use, expose burlap side of blanket to sun or air, allowing burlap to dry, then continue the application over and over-- following this procedure. has the strength and water-distribution features of 10 oz. burlap combined with the moisture-retention and reflective features of 4 mil white opaque poly, extruded into burlap. is a revolutionary method of curing concrete. 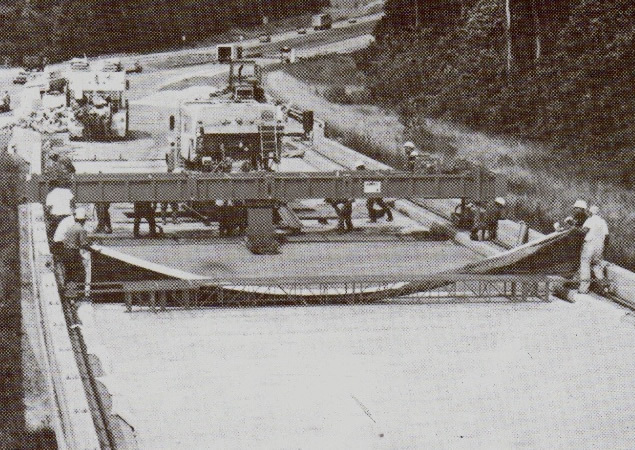 Designed specifically for the curing of concrete slabs, such as bridge decks, highways, buildings, airport runways, military installations, etc. offers two important functions that make the big difference in results. burlap layer distributes water evenly (much like the wick in an oil lamp). Second -- white opaque poly layer helps hold in the moisture and reflects the sun's rays to help keep the concrete wet and cooler at a more even temperature. has already proved its great advantages in many areas, and is being approved as one of the most effective, most economical methods of concrete curing on the market today.